Build on What You Know You have already learned that Rome overthrew its kings and formed a republic. This change to self-rule would not only affect Rome's government. It would also affect Roman society. ESSENTIAL QUESTION How was Roman society structured? As Rome developed into a complex civilization, two classes arose. Inequalities between them would lead to conflict. This conflict, however, would eventually define Roman citizenship and the rights of citizens under Roman law. The upper-class patricians (puh•TRIHSH•uhnz) were wealthy landowners who held all of the highest positions in government. The plebeians (plih•BEE•uhnz) were mostly common farmers. Like all male Roman citizens, they could vote, but they couldn't hold important government positions. Resentment over the patricians' power caused tension. Finally, the patricians passed a written constitution, called the Twelve Tables, around 450 B.C. The Twelve Tables established basic rights and duties for Roman citizens. 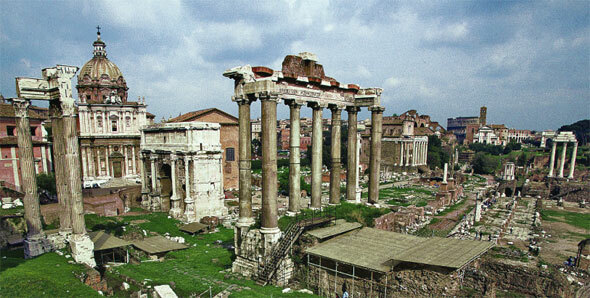 Roman Forum - Ruins of the Roman Forum, the religious, cultural, and political heart of Rome, still stand today. In the early days of the republic, the Senate met in a small building in the Forum. ESSENTIAL QUESTION How was the republican government organized? The leaders of the Roman Republic established a tripartite (try•PAHR•tyt) government. This type of government has three branches: executive, legislative, and judicial. The executive branch enforces a country's laws. The legislative branch makes the laws. And the judicial branch interprets the laws in court. The legislative branch of Roman government included the Senate and the assemblies. The Senate was a powerful body of 300 members that advised Roman leaders. Most senators were patricians. The assemblies were mainly made up of plebeians. Their representatives protected the rights of plebeians. The judicial branch consisted of eight judges who served for one year. They oversaw the courts and governed the provinces. Two consuls led Rome's executive branch. They commanded the army and directed the government for one year. Each consul had the power to veto, or overrule, the other. In times of crisis, the consuls could choose a dictator—a leader with absolute power—to rule in their place for a limited time. Around 460 B.C., a man named Cincinnatus (SIHN•suh•NAT•uhs) was made dictator to defend Rome from attack. According to legend, he defeated the enemy and returned power to the consuls in sixteen days. 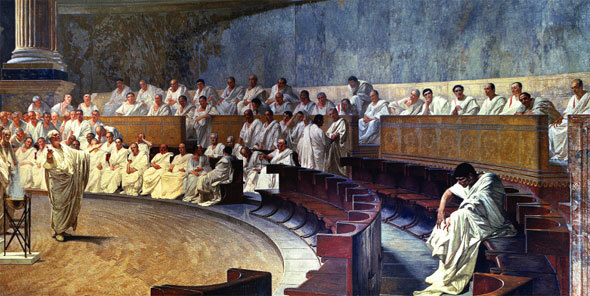 Senators - In this 19th-century painting, a speaker addresses his fellow members of the Roman Senate. The U.S. government adopted several features of the Roman Republic. You can compare the two systems in the chart above. Like the Roman government, the United States has a tripartite system. The U.S. system of checks and balances makes sure that one branch of the government doesn't have too much power. This system is like the veto, which limited the power of Roman consuls. In addition, like Rome, the United States has a written constitution on which its government is based. Citizenship is also an important part of a republican government. In the Roman Republic, only free adult males were citizens and could vote. Only these citizens enjoyed the protection of Roman law. They also were expected to perform civic duties. That means that they were expected to serve their nation. Cincinnatus showed civic duty by defeating the enemy and stepping down from power. American citizens show civic duty by voting, taking part in jury duty, and paying taxes. ESSENTIAL QUESTION How did Rome expand? For hundreds of years after the founding of the republic, Rome expanded its territories. By the 300s B.C., the Romans dominated central Italy. Eventually, they conquered the Etruscans to the north and the Greek city-states to the southeast. By 275 B.C., all of the Italian Peninsula was under Roman control. In general, Rome did not impose harsh rule on conquered peoples. The republic offered Roman citizenship to most of the conquered peoples and allowed them to govern themselves. In return, they had to pay taxes and provide soldiers for the Roman army. Rome needed these soldiers to fight in the Punic Wars, which began in 264 B.C. The Punic Wars were a series of three long wars against Carthage, a rich trading city in North Africa. The specialized vocabulary term Punic Wars refers to the series of wars between Rome and Carthage. Carthage was once a colony of Phoenicia, a group of sea-trading city-states on the Mediterranean. Punic comes from the Latin word Phoenician. The Roman conquerors brought back great wealth and many slaves. They bought large estates and farmed them with slave labor. But because many small farmers couldn't compete, they lost their farms. As a result, unemployment and poverty increased. The gap between rich and poor grew wider. This, in turn, produced more anger and tension between the classes. 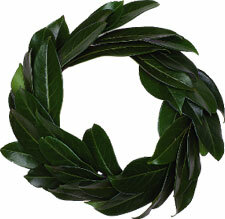 Laurel Wreath - Roman generals wore a wreath made of laurel leaves after winning a major battle. The Romans adopted this symbol of victory from ancient Greece. Early Rome was divided into two classes—patricians and plebeians. The Roman Republic was a tripartite system that provided a model for the U.S. government. Roman expansion brought new lands and great wealth for Rome. Some of the most basic values and institutions of the United States, such as civic duty and a separate judicial branch, began in the Roman Republic.